aware of a hot new internal cabinet accessory. The 2019 IKEA catalog has arrived and that means new IKEA kitchen design opportunities! shelves, dishwashers and a refrigerator with freezer compartment. Noteworthy, IKEA has also discontinued some items for 2019, including certain cabinets, cabinet lighting and its online appliance buying guide. But fear not, this only means that other IKEA product replacements are available. Available to order now, the 2019 IKEA catalog offers a variety of options, and we’re here to walk you through what’s in – and out – for IKEA kitchens in 2019. 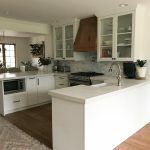 The first noticeable change for the 2019 IKEA kitchen line is the introduction of TORNVIKEN open cabinetry, available in off-white, which replaces HORDA, which is now discontinued. This was a somewhat expected change since HORDA colors were considered outdated by some. The IKEA TORNVIKEN cabinet features contoured and decorative edges which make them perfect for a more classic and traditional kitchen style. TORNVIKEN also perfectly match IKEA’s BODBYN cabinet fronts, which are very popular. The JARSTA door was upgraded as well, from an orange color to a high gloss black-blue shade. While we at IKD see more and more of this blue in two-toned color kitchens, the JARSTA still comes in limited sizes, so it continues to be considered an accent door. However, there is now a brand new open island/wine cabinet, called VADHOLMA, which creates many storage opportunities with open storage, kitchen island applications and wine shelves. It also features a butcher-block kind of color that makes it ideal for the trending use of wood countertops and floating shelves. In regard to the new appliances, IKEA customers now have two options when it comes to integrated dishwashers: SPOLAD and VASKAD. Designed as substitutes for the RENLIG integrated dishwasher, both of these IKEA dishwashers have tall interiors and can be aligned with the rest of your IKEA kitchen cabinetry as they are panel ready for a fully integrated look. The main difference is that the VASKAD dishwasher has three levels, which makes it extremely spacious, functional and easier to organize. Its upper basket is adjustable to make room for bigger plates and additional storage options. The new LAGAN fridge is not just a beverage refrigerator. It is a small, free-standing bar refrigerator complemented by a separate fridge compartment as well as adjustable shelves; perfect for rooms of all sizes – whether it be in a compact kitchen, basement, pool house, etc. While the KUNGSFORS wall storage series is not new – there are a couple of new containers, hooks (including an s-hook),a new stainless steel clip, magnetic knife rack, rail. It offers many storage options and a stainless steel shelf and wall rack that creates an industrial and timeless look. These new offerings provide so many creative design opportunities, particularly since IKEA kitchen products have standard heights and widths that allow endless combinations and pairings. The design is really only limited by the customer’s imagination and personal style. Perimeter cabinets in RINGHULT high-gloss white paired up with a kitchen island with the new JARSTA high-gloss black-blue, to provide a splash of color and interest without the blue being overwhelming. TORNVIKEN, in off-white – with or without the wine bottle insert – are a perfect and obvious match for BODBYN doors. TORNVIKEN open cabinets can help complete the traditional look with extra and versatile storage solutions. Select the KUNGSFORS wall storage series to enhance the overall style of the kitchen. The stainless steel can be paired up with a flat modern front like KUNGSBACKA, or go for an all stainless steel option pairing it up with GREVSTA doors. It will be interesting to see if there will be a replacement for the ‘Wood Effect Brown’ cabinet frame, as well as the UTRUSTA cabinet lighting – specifically the corner joint. “Even though the‘Wood Effect Brown’ cabinet frame isn’t visible once doors and panels have been installed, it was a good complement for dark fronts,” she says. TUTEMO cabinets in yellow and blue were also discontinued for 2019. However, TUTEMO cabinets in ash and anthracite ontinue to be a highly popular solution for open cabinetry solutions. Without an available buying guide for 2019, IKEA customers can go directly on IKEA’s website, under Kitchen Products, to find product information. And of course, they can utilize IKD’s expertise. “Buying guides are a great tool for customers, and without them, there’s a growing demand for a source of knowledge and information that IKD can supply,” says Paulina. “We provide guidance not only on fronts’ colors, styles and finishes, but also on interior organization, lighting and personalization.The need for expert advice and guidance influence the way we provide our services, adapting our skills to meet the customers design and information needs.”IKD designers are always up-to-date with IKEA kitchen product changes. We’re IKEA kitchen design specialists who work exclusively with IKEA kitchen customers. 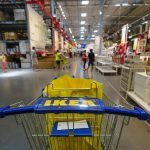 What do the changes in the 2019 IKEA kitchen inventory mean?